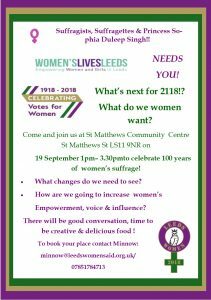 As part of our year of exciting activities to celebrate the centenary of (some) women getting the right to vote we are holding workshops across the city to give women the opportunity to have their say about what matters to them, what needs improving and how to increase women’s voice and influence in the city. The workshops are all free and a brilliant opportunity to try something new, meet other women in the city, find out about how you can get involved in influencing decision-making in Leeds and get your voice heard about what matters to you! Our next workshop is on Wednesday 19th September 1-3:30pm at St Matthew’s Community Centre LS11 9NR. There will be good conversation, an opportunity to get creative, and of course, delicious food!